It is always difficult when one is faced with the dilemma of following ambition or sentiment. Do you go with your aspirations, or do you follow your heart? When considering my entry for this month’s Sugar High Friday, I ran into that exact puzzle. On the one hand, I was inspired to try something challenging - something a bit avant garde and terribly, terribly chic. I envisioned a multi-component dessert, gorgeous and elegant, along the lines of the creations of Pierre Hermé or Thomas Keller. Reining in my enthusiasm, I stopped to focus my thoughts. When thinking of white, what was my first impulse? Without question, the answer was clear - coconut. And whenever I think coconut, thoughts of my dear Mum are never far behind. For as long as I can remember, my Mum has loved coconut. Even though she’s not known for indulgence, I automatically associate her with those coconut-filled bonbons that are part of any box of assorted chocolates. Coconut macaroons, there's another favourite. The more I thought, the more I realized my Mother’s coincidental fondness for pale-coloured ingredients. Meringues, pavlovas, custards ... all are sweets high on her list. In fact, whenever she comes across any dessert involving meringue or coconut in my cookbooks, the recipe is usually met with a sigh of appreciation. With that in mind, I decided that for my entry I would make something for my Mum. And so my conundrum. My Mother is direct in her likes. She is one that favours a laden table with family and friends over a plated meal any day. She hosts with thoughts of bounty and abundance, of making sure that everyone is fully taken care of. Between her and my Father, I would be hard-pressed to think of an occasion when I have left their house hungry. A dessert that was twee or over-styled seemed inappropriate for her. Something simple, but pretty, and utterly delicious; that was surely the route to choose. 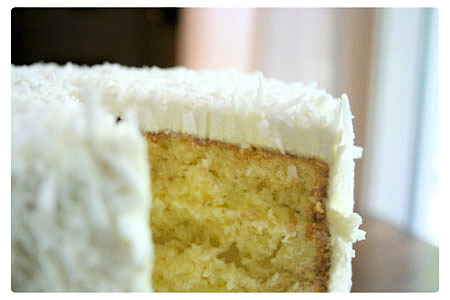 Heart won out over headstrong ideas of culinary feats, and a coconut cake was where I settled. Buttery, tender and (somewhat suprisingly) not too sweet, this cake is traditional home baking at its best. 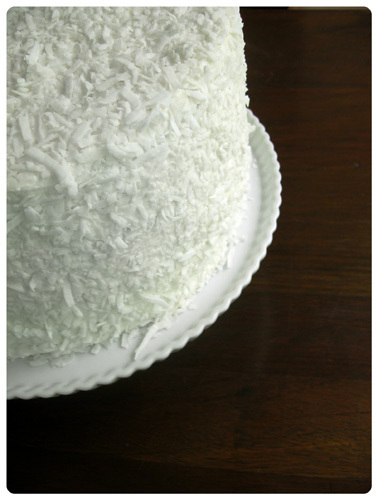 Far from the cellular sponginess of a boxed cake, the texture is toothsome with shredded coconut. The filling, not called for in the original recipe, is from Martha Stewart. It is a thick but not a cloying curd, studded with even more coconut strands and adding a welcome custard blanket over the layers. I chose a Swiss meringue buttercream for its marshmallow richness that is dense, but still light to the tongue. This entry truly became a family affair. Many thanks to my nephews, one who particularly loves coconut, for gobbling up the result of my work. And my gratitude goes to my brother for taking two of the photographs featured. Ina Garten's variation on the famous coconut cupcakes from her Barefoot Contessa Cookbook. I've added a coconut cream filling and chosen a Swiss meringue buttercream for the frosting. • I split the cake into four layers. 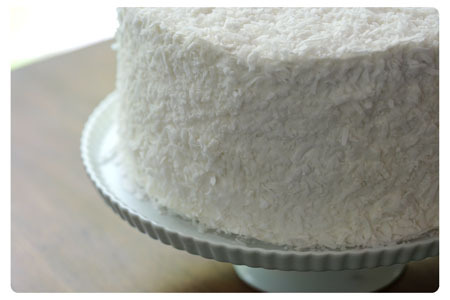 This cake is rather delicate and crumbly with all the shredded coconut; take particular care when cutting and assembling the layers. • For the cake, I substituted 1/2 cup unsweetened coconut milk and 1/2 cup sour cream for the regular milk called for. I also substituted 1 cup plus 2 tablespoons of cake flour, for 1 cup of the all-purpose flour, for added whiteness of the final crumb. • I cut down the almond extract, as I felt it overshadowed the more delicate vanilla and coconut. • For the cream filling, I substituted 1 cup unsweetened coconut milk for the regular milk called for. Ahh, the changing personality of white. The milkiest tones are soothing and fresh, while the chalkiest are stark and dramatic. The slightest shades of suggested colour bring moodiness and depth. It can be the quality of light on a blisteringly hot summer’s day, or the muffled whiteness of a snow-covered landscape. Almond, cream, malt, vanilla, buttercream; all not only evocative colours, but flavours as well. With this tempting palette in mind, I am happy to announce Shades of White as the theme for this month’s Sugar High Friday, the dessert-based food blogging event created by Jennifer of Domestic Goddess fame. 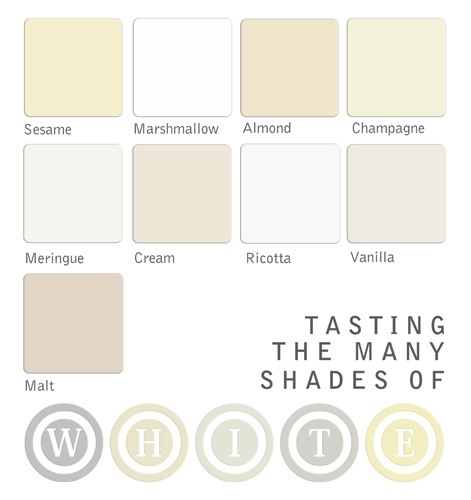 Participation is simple; make a dessert featuring your chosen hue of white. Anything from the palest of champagne ices to frothy zabaglione to the barest tan of hazelnut cookies. Or let the character of form inspire; are you drawn to the simple elegance of blancmange, or the childhood taste of marshmallow, or the towering excess of a meringue crowned pie? The possibilities are endless. Then, let us know about your culinary artistry, maybe explaining why you chose this dessert or what you liked about its particular shade. I will post a roundup here, so we can compare notes. 1. Sugar High Friday #31 roundup will be posted on Friday, May 25, 2007. 2. Please post your recipe on your site on Monday, May 21st, then email me by Noon EST Wednesday, May 23, 2007. Be sure to include your name, your blog name, your location, the recipe name and a permalink URL to the story. If possible, please provide a 100 x 100 pixel photo of your masterpiece, so I can include it in the gallery for the roundup. For ease of organization, please label the image file the same as the name of the dessert. 3. If you do not have a blog, please feel free to post your thoughts, ideas or feedback in the comments section of the Sugar High Friday posts. If you have a longer comment, you can also email me, and I will include your entry in the roundup. One last thing, a plea - this is my first time hosting a food-blogging event. So be nice to the newbie! I hope you find the theme inspiring; I invite everyone to join.